I would love to tell you why one day I ended up with the idea of hair coming out of a faucet, and then the realization that it should be bloody hair, and that it should be a nice white basin instead of a grungy work sink, but I can’t. These images appear unbidden, sometimes unwelcome. 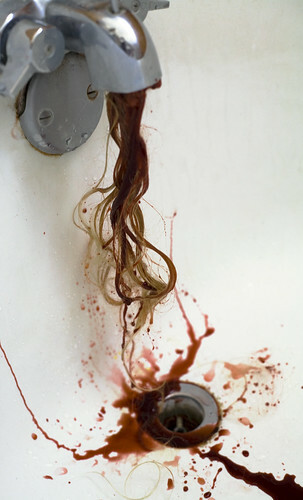 I mean, really, do you think I enjoy watching a movie and finding myself distracted by the thought of bloody hair in a sink? The first type is the opportunity photograph. I wander around with my camera and look for something to document. Sometimes these come out well but most of the time they’re only average. I rarely get truly excited about my spontaneous opportunity photographs – they function mainly to alleviate boredom and keep my camera skills from going completely and utterly dull. I won’t deny though that occasionally I get that “HOLY CRAP” moment from having been in the right place at the right time. The second is the meticulously planned photograph. These are always my favorites, and they’re the ones that materialize in my thoughts and crystallize over the course of a few hours (or days, or months) and one day I finally get them out and gone and finally feel relief. These are also everyone else’s favorites, if Flickr and casual conversation are reliable metrics. They also usually involve props – lately props that I have to go out and spend real money on, since I don’t keep dentures and jack-in-the-boxes and hair and octopi and fake blood around the house. The third type is special – it’s the photographs that don’t get taken. For every sticky idea I get that grows in my head and feeds on weird dreams and festers until it’s time to be created, I have five that go nowhere. I keep a checklist online of photo ideas, and it seems that it stays populated with those that just aren’t quite good enough. For example, some of the items currently on my list are: corndog, cardboard box half-person, manticore, someone in the will-call room, shadow with a hole in it. I don’t need detailed notes because just reading the words reminds me of the full image. So often, though, that image just never comes to life. It’s not that I don’t have the time to make them, or the resources, or skill – I just end up letting them drift. It’s only every fifth one that really grabs me, that I end up thinking about over and over until I find myself at Party City trying to find a cheap blond wig and debating store-bought fake blood versus making my own. I ended up making my own, of course. I always do. In short, there’s no explanation why I take the photos I take. Either I’m there with my camera, or there’s some dream-inserted image that won’t let me go, and one way or the other I end up with a picture.